Roger Federer returns to the ATP World Tour after a brief layoff at the Cincinnati masters. The Swiss maestro is seeking his fifth title at the Western & Southern Open, having previously won in 2005, 2007, 2009, and 2010. Federer is back atop the rankings since winning his 17th grand slam at Wimbledon. The world #1 will face either Jarkko Nieminen or Alex Bogomolov Jr in the second round after receiving a first round bye. 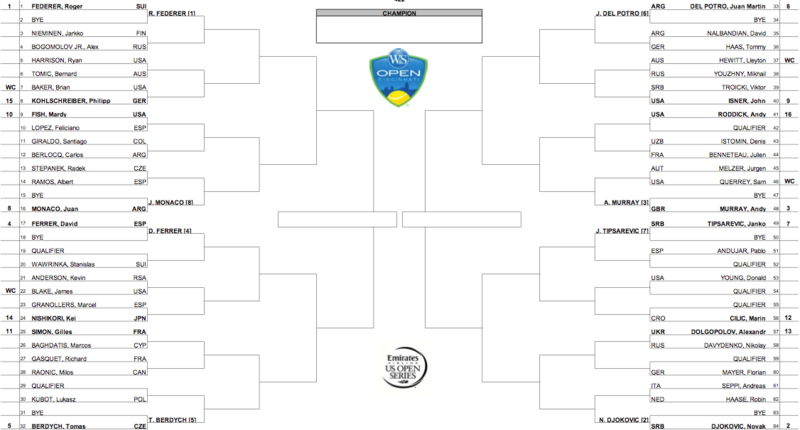 He could face Phillip Kohlschreiber, Bernard Tomic, or Ryan Harrison in the third round. With Rafael Nadal withdrawing (already withdrew from Olympics and Toronto masters), Novak Djokovic and Andy Murray lead the opposite half of the draw as the #2 and #3 seeds, respectively. Federer’s seeded opponent in the quarterfinals is Juan Monaco, who has risen into the top 10 in recent weeks. A potential semifinal lurks against either fourth seeded David Ferrer or fifth seeded Tomas Berdych, with likely Djokovic or Murray in the final. View the full draw and (Federer) press conference below. Play begins Sunday, August 12. Federer is likely to play Wednesday, August 15. Watch full coverage of the Western & Southern Open (Cincinnati masters) on FF07tv.